Water blasting is the use of water with high pressure and high speed to clean and treat various surfaces. It can also be used to cut through different solid materials like steel and concrete. The advantage with water cutting compared to laser cutting is that the heat generated is transported away by the water, hence it works for sensitive materials where a laser cannot be used. The high pressure is achieved by an engine and a pump. 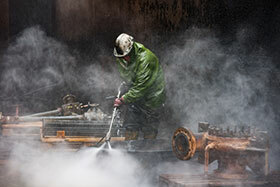 When the water passes through a small nozzle or orifice it attains the speed that makes it effective for blasting. If needed the water can include additives like detergent chemicals or abrasives. However, in many applications plain clean water can be used, which makes it an environmentally friendly method. The equipment for water blasting consists of a motor, pump, water tank, valves, hoses and nozzles. Since the pressure rating is up to 6000 bar, the requirements for the included components are high. It should in some applications also withstand extreme temperatures and abrasives, and also work in harsh environments with abrasion, seawater, ozone, chemicals and extreme temperatures. WOMA has been producing water jetting equipment for more than 50 years for removal, cleaning and cutting, and can supply stationary as well as mobile units. These are delivered all over the world. WOMA relies on Parker hoses and fittings when building the equipment. The choice of Parker components is based on Parker’s reputation for high quality and the fact that WOMA delivers products worldwide, so it is an essential requirement that the hoses and fittings are globally available. The hoses that WOMA uses are Blastopac 1.25 cm rubber hoses and Blueline 1.25 cm thermoplastic hoses with pressure rating up to 6000 bar. This meets the requirements of the global specification DIN EN 1829/2. Blueline is Parker’s series of thermoplastic ultra-high pressure hoses. These hoses have up to 35% less weight compared to rubber hoses, which greatly facilitates daily work. They are resistant to many chemicals and abrasion in tough environments, which guarantees a long service life. The Blueline series with the hose types 2388N and 2580N provides a coherent series together with the matching fittings from Parker Polyflex. Another advantage of Parker hoses is their worldwide availability. Parker Blastopak hose is a completely new hose range with improved performance for water blasting applications. The high performance is a result of the design, with four or six spirals that meet the requirements of water jetting and blasting applications. With its high working pressure from 800 bar in size 16 up to 1100 bar in size -4 to -12, flexibility combined with dedicated interlock fittings ensures superior performance and safety.The safety factor burst/working pressure of 2,5:1 allows the hose to meet the requirements of global specification DIN EN 1829/2 (impulse) in all common hydraulic applications. WOMA is a certified distributor of Parker’s ultra-high pressure hoses and fittings, with a facility in Durban. In this facility, hoses and fittings are assembled in order to serve the South African market. Its presence in South Africa gives WOMA an advantage over its competitors.